EnergyBet and EnergyCasino have created their very own Fan Zone at the Beach Garden Hotel, St. George’s Bay, St Julian’s, Malta this summer. So, if you’re around the islands this summer, you’re invited to come and watch every football match LIVE from Russia and enjoy a drink and bite with the Energy crew! In fact, it’s little wonder that the islands are going football crazy this summer – Malta is the perfect place to experience the World Cup! With gorgeous warm weather ideal for watching matches on big outdoor screens, while enjoying a nice cold drink – and in such a small country, full of expat workers, you don’t have to look far to find fans from every nation competing for glory in Russia this summer. Of course, the favourites – Brazil, Germany, and Spain – have small armies of fans even here in the Maltese islands, but the other front runners like France, Argentina, and Belgium are also well supported, with flags popping up on balconies all over town. We’re expecting a good showing from Poland and England fans at the Beach Garden too, so we’ll have plenty of snacks and distractions in case Nawałka’s and Southgate’s lads fail to deliver. 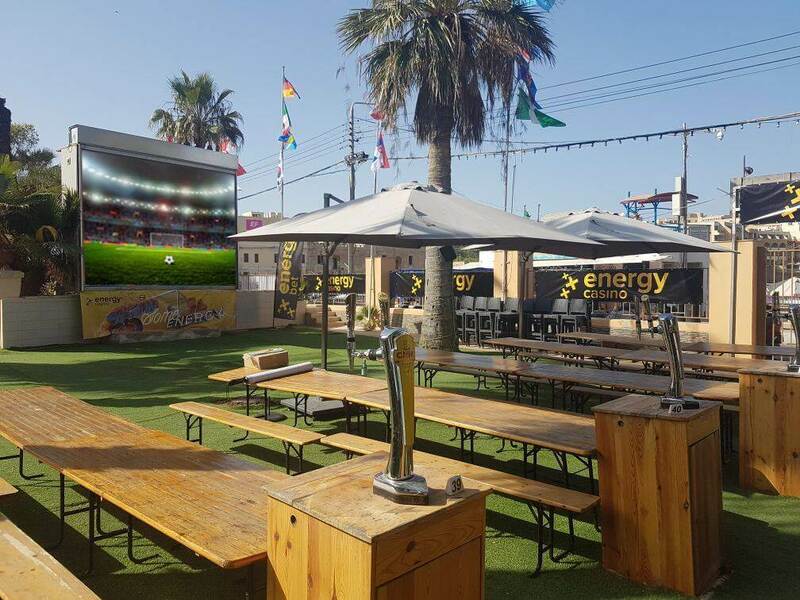 So, if you’re in Malta and around the St. George’s Bay area between the 14th June and 15th July, make sure you come down to the Beach Garden Hotel – all the matches from Russia will be shown LIVE on a giant screen, entrance is FREE, and there will be food and drinks available during the matches. Oh, and if you’re looking for a rewarding new career in iGaming or sports betting, don’t forget to ask the Energy team about opportunities at EnergyCasino and EnergyBet, because we’re looking for new talent! The team behind EnergyCasino and EnergyBet bring you the latest gaming, betting and sports news. Insider information, expert commentary and exclusive offers all in one place. Make sure you don’t miss a thing.